I'm still not over my love for a black and red buffalo check! I created the pattern using the Plaid Maker stamp set - I stamped the images in black onto a sheet of red cardstock. 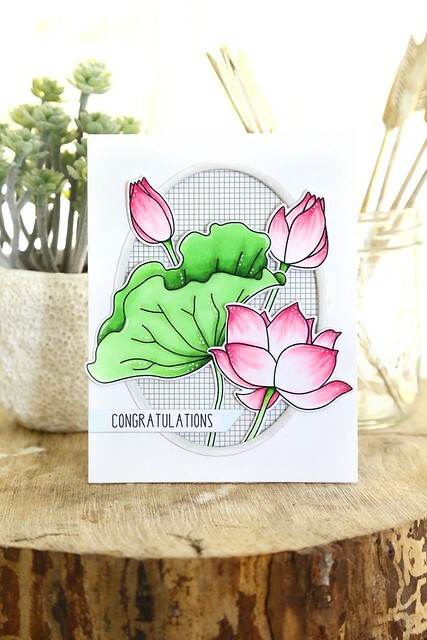 This stamp set is so easy to line up and use! Don't be intimidated by it. I love that the squares are so nice and big. Once that base layer was created, I used a Reverse Stitched Scalloped Square Window die to create an area for my focal image. The sweet deer (from Oh Deer) was stamp and colored with copic markers. My favorite combo for light brown critter coloring is E30, E31 and E33. I set him against snow drifts, and backed him against a snowy night sky. 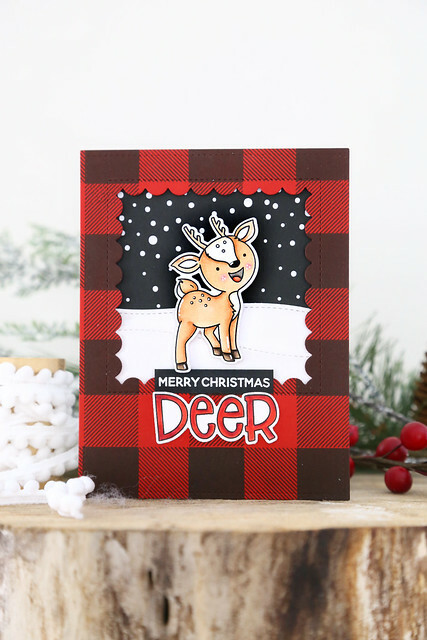 The first part of the sentiment was heat embossed onto a strip of black cardstock, which I trimmed out to fit over the larger DEER. I love that I could colored and die-cut that word! Welcome back to another day of this month's Lawn Fawn inspiration week! 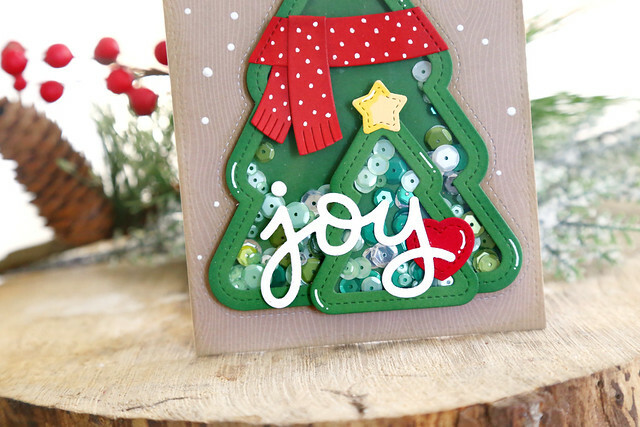 Today, we're showing off the Outside In Stitched Christmas Tree Stackables as well as the Stitched Christmas Tree Frames. I created 2 Christmas tree shakers, and fit them into a layer of woodgrain patterned paper. I wanted everything to have dimension, but still lay pretty flat on the card. In lieu of a stamped sentiment, I opted for the Scripty Joy die. It's not obvious in the pictures, but I really wanted it to stand out, so I layered 3 die-cuts on top of each other. It helped give the die-cut a bit of dimension and clarity. I hope you like it! 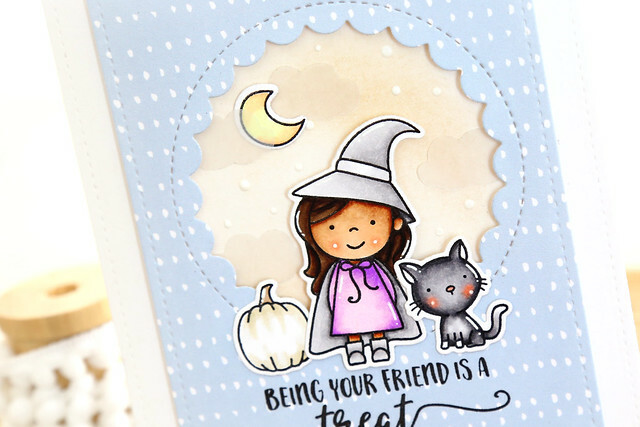 If you'd like more details on this card, and to see it re-created from start to finish, head over to the Lawn Fawn blog and watch Kelly's video - she's made a version of this card today. 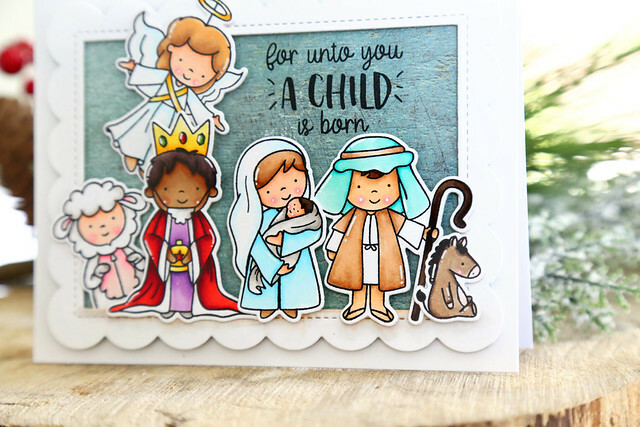 I'm here and on the Neat and Tangled blog this morning, with a card that combines 2 of our newest sets, Nativity Play and Angel Wings. 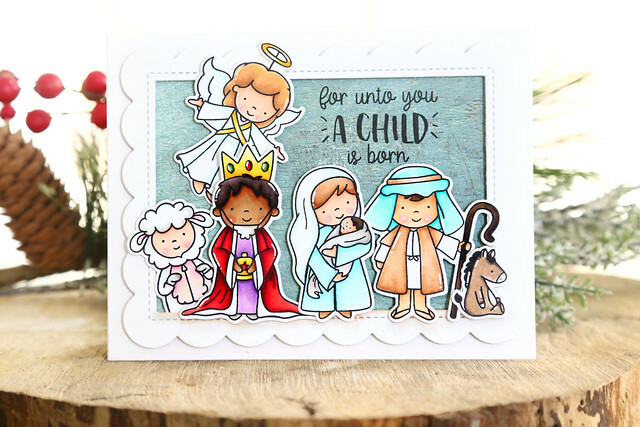 I am so happy to have a nativity set for my Christmas cards this year! 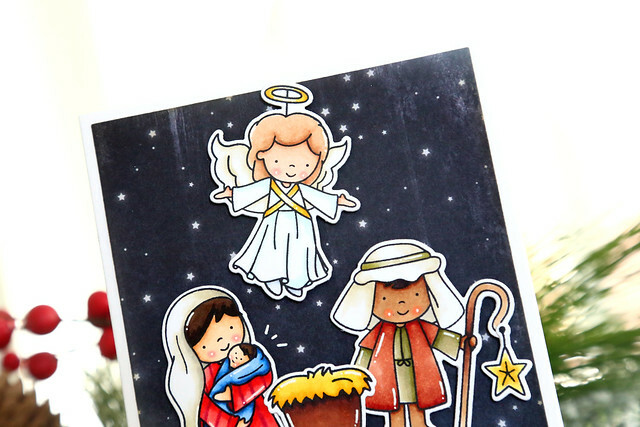 I stamped out Mary and Joseph and colored them with copic markers. I created stripes in Mary's tunic with a darker red marker, and gave Joseph a darker skin color. I just love the way Mary is looking down at baby Jesus! The angel has come to give them good news! I know the angels come to tell the shepherds, but still. 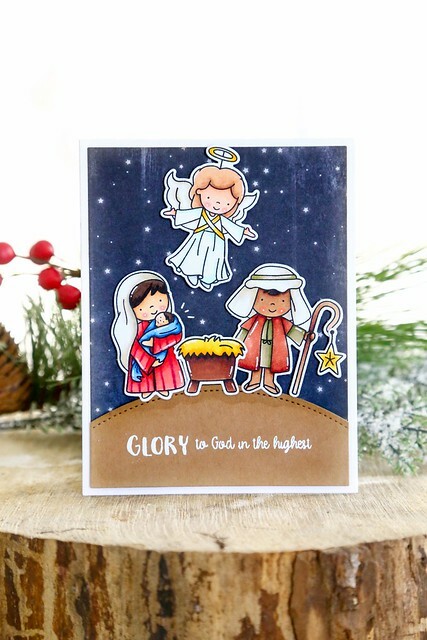 Maybe I'll create another card with a few shepherds and sheep! Joseph could definitely stand in for a shepherd and the sheep in Nativity Play kills me, he's so cute. I set the images against a patterned paper of night sky, and the sentiment was heat-embossed onto a kraft-colored hill. With a W1 copic marker, I added some shading below the images. 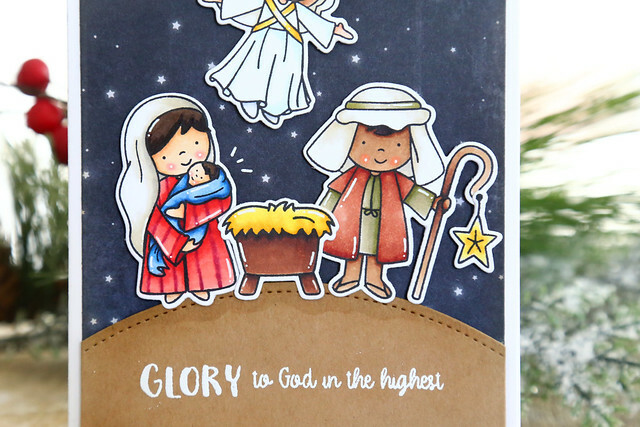 I love how this adds dimension and grounds Mary and Joseph. I hope you like it! If you create anything with any of these new sets, we'd love to see! Be sure to tag us #neatandtangled on instagram! I really love the detail of these dies - the stitched circle and the soft scalloped inside is so pretty. I created a simple scene using the bears from Winter Skies. They are cuddled under the same scarf and looking up at Santa, across a night sky. 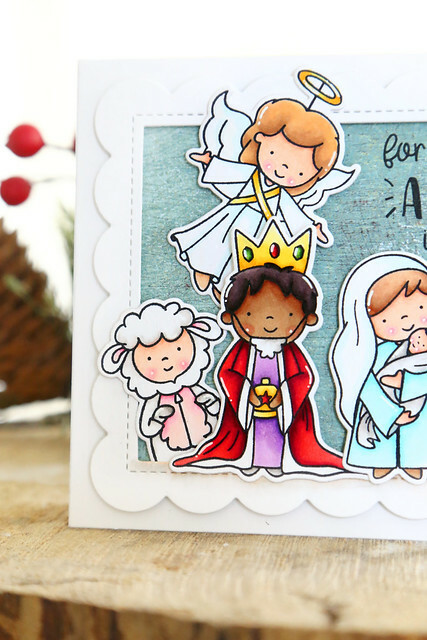 It's a sweet, simple card that could easily be replicated for your holiday cards! I hope you like it, and be sure to check out the LF blog this morning for even more inspiration - click! 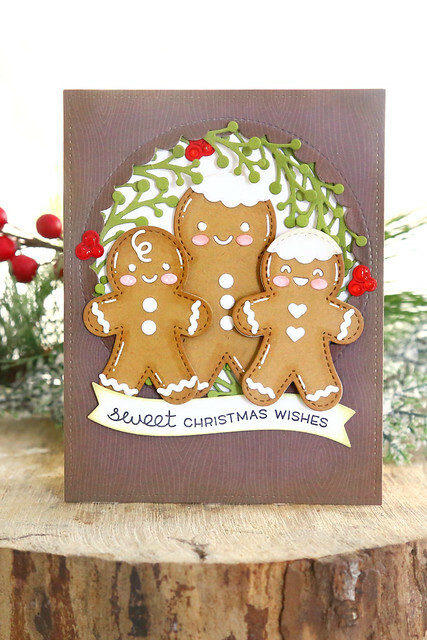 This card was such a bear to photograph, but those gingerbread dies are the sweetest things! I create a trio of gingerbread friends, giving them blushy pink cheeks and extra dimension by ink blending around the edges. I reached for the Spring Sprig die to add greenery all around the Reverse Stitched Scalloped Circle Window. The little red berries are from the Woodland Critter Huggers Winter Add-On set. Those elements really help to break up all of the brown on this card. 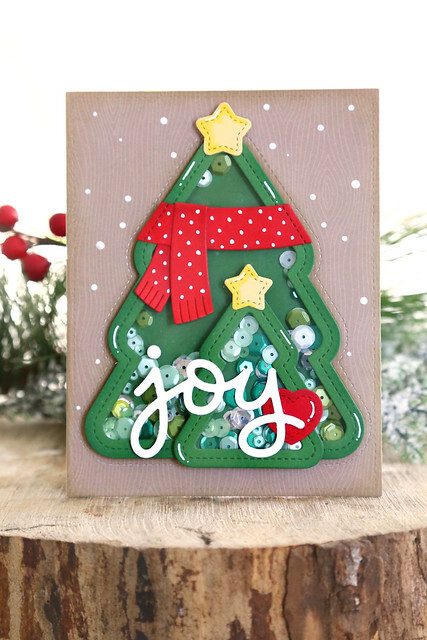 I created this card for yesterday's Reveal Wheel Holiday Sentiments showcase. 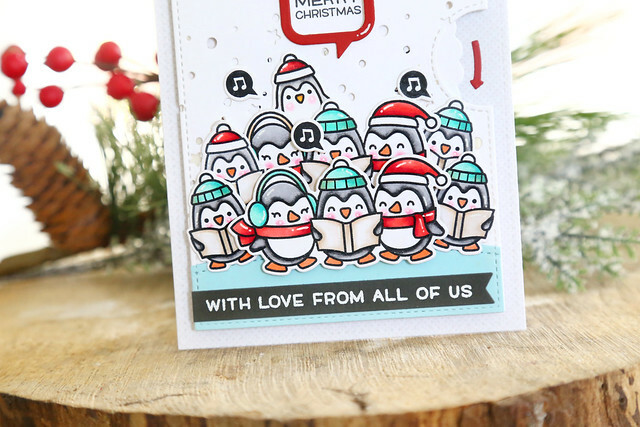 I just love these caroling penguins! I layered the Here We Go A-Waddling penguins so that it looks like a big group. The littlest penguin peeking out at the top is from Say What? Christmas Critters. When you spin the wheel, the new sentiments appear within the speech bubble. It's so much fun to play with! Welcome to day 1 of this month's Lawn Fawn inspiration week! 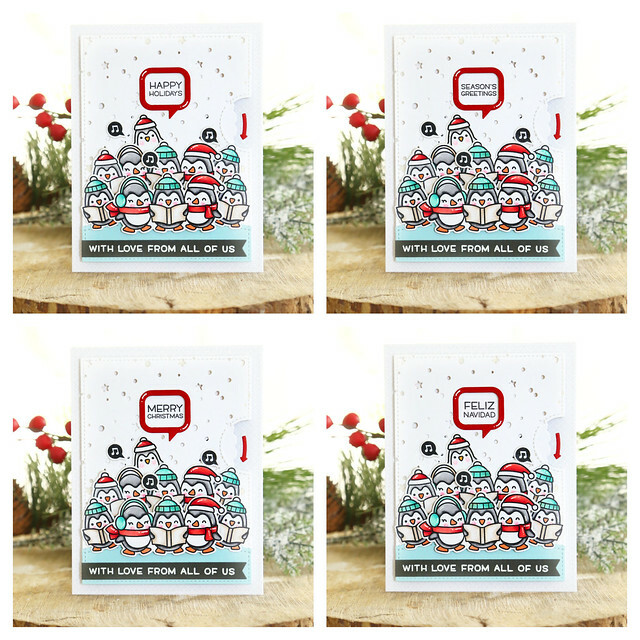 Today, we're showing off the BEARY cute Oh What Fun stamp set and matching dies. I did some ink blending with different distress inks (faded jeans, tumbled glass and black soot) to create the rich blue background. The Santa-bear was placed high in that sky, over the little Winter Village houses. I set the houses onto layers of the Stitched Hillside backdrop, and added a forest border behind to fill in the scenery. I love how Lawn Fawn creates these products to work together! Doesn't he look a little like Winnie the Pooh? ugh, so cute. I hope you like it! There's more to see on the LF blog this morning - click! 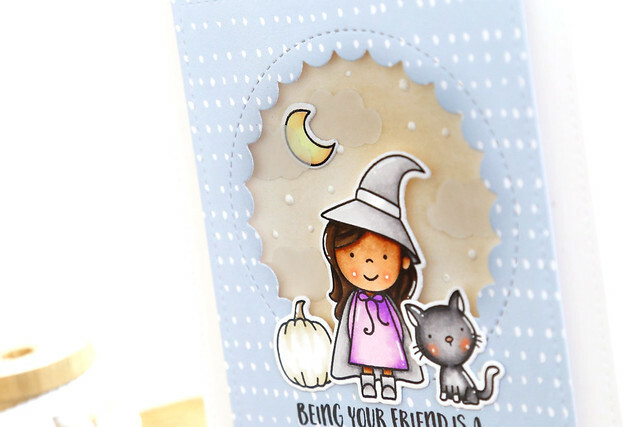 Welcome back to the last day of new product reveals for Neat and Tangled's October release! All of the products shown this week will hit the store tomorrow morning, by 8am EST. Before I talk about the card, I just want to thank my friend Merry Firschein, who was kind enough to help me make sure that the sentiments were appropriate and would be fun to use on Hanukkah cards! I colored the images and set them onto a panel that I ran through with the Stitched Sunburst die. I actually ran it through with that die 2 times, rotating it before the 2nd time, so that the burst effect was more detailed behind the kids. Apparently, if your dreidel lands on gimel, you win! I thought that was such a fun sentiment suggestion. If you celebrate Hanukkah, I especially love to know what you think of this little set! As always, don't forget to leave a comment before you go - there will be a winner chosen from among all of the DT blog comments this week. 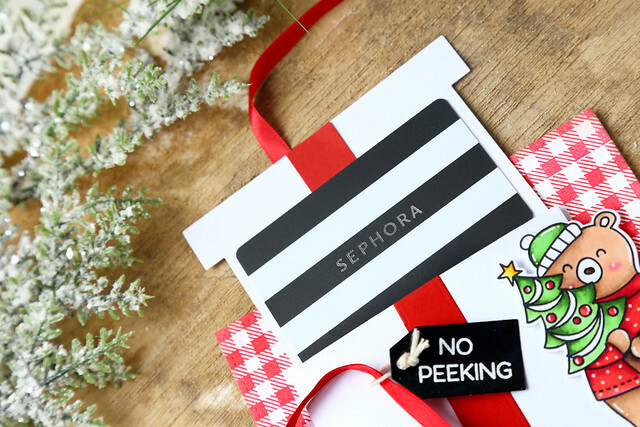 A $25 store gift card is up for grabs! 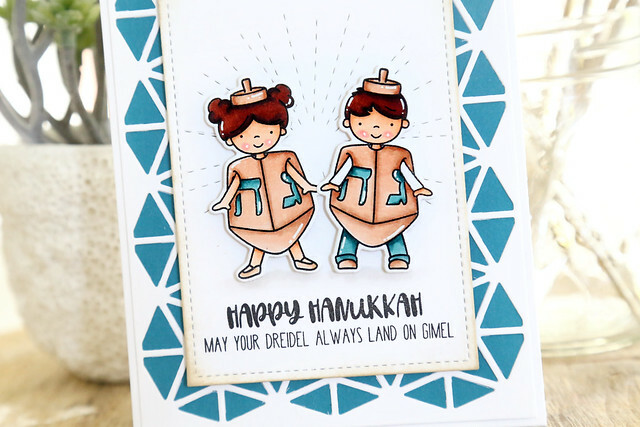 And be sure to check out the NT blog this morning, for more Darling Dreidel inspiration! Welcome back to day 3 of this month's Neat and Tangled release week. All of the products shown this week will hit the store on Friday morning, 8am EST. 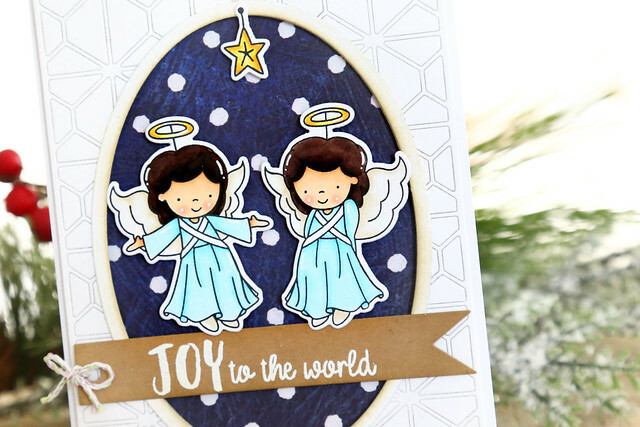 Today, we're showing off the Cubic Cover Plate die, and I've used it with other products already shown this week: Angel Wings and the Card Front Designs dies. 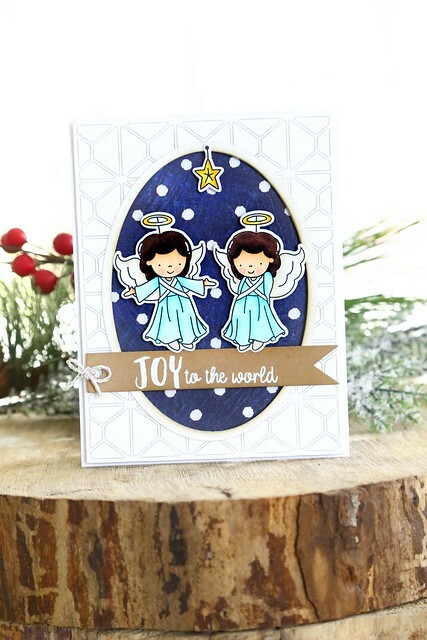 I stamped, die-cut and colored the mirror-imaged angels, and set them against a piece of patterned paper. I kind of love the angel on the right, looking a little shy. 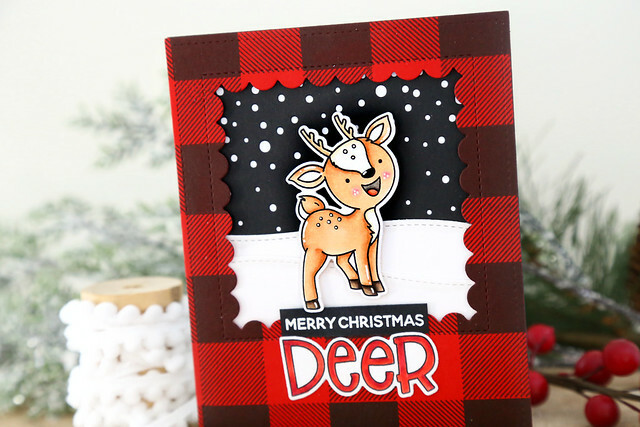 I used the Card Front Designs oval dies to create a frame that cuts into the Cubic Cover Plate. I kept the cover plate all white, so that it adds texture to the card, but remains subtle. I didn't want to take away from the angels! I hope you like it! Be sure to leave a comment here before you go! A winner will be chosen from among all of the participating design team blog comments this week and announced on Friday morning. You could win a $25 store gift card! 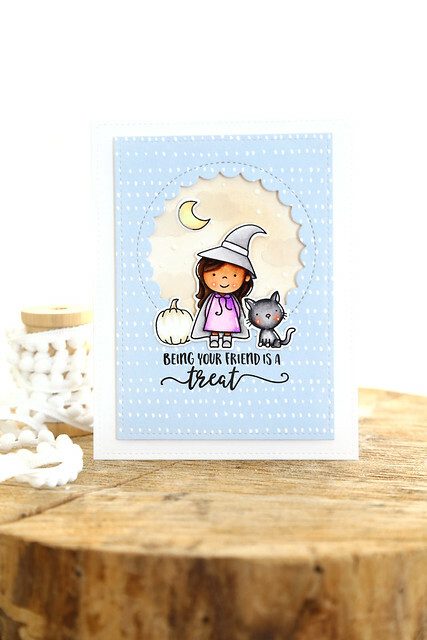 And hop on over to the Neat and Tangled blog this morning to see what the rest of the team crafted for you today - click! Welcome back to day 2 of this month's Neat and Tangled release week. All of the products shown this week will hit the store on Friday morning at 8am EST. I also used a new die set, Card Front Designs, to cut out the oval frame for this card. I colored the florals with copic markers in shades of bright greens and pinks. I then set them against a subtle grid patterned paper and colored the oval frame with a warm grey copic marker to match the paper. All of the flowers are popped up using foam tape, to give the card some nice dimension. I just love how large the lotus images are! I hope you like what you see so far! 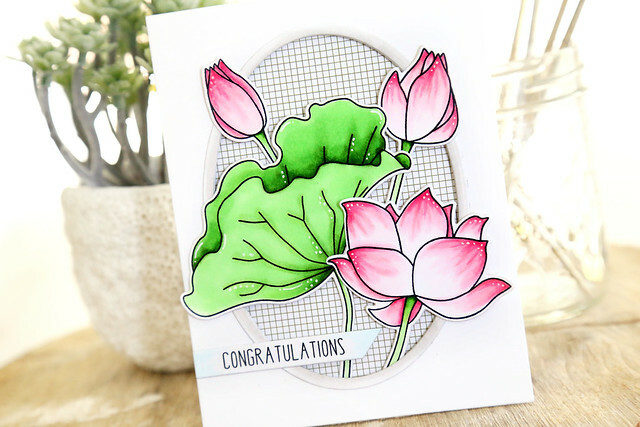 There are more beautiful lotuses on the NT blog this morning - click! Before you go, don't forget to hop around the DT blogs and leaves comments - there will be a winner chosen at the end of the week, from among the DT blogs. The winner will receive a $25 store gift card! Welcome to day 1 of this month's Neat and Tangled release week! All of the products shown this week will hit the store on Friday morning by 8am EST. I colored all of the images with copic markers, and piled them into a scalloped frame. They are so much fun to color! That sheep is my absolute fave. I'm planning on keeping him around for easter-y cards too! The wise man, with his stringed-up beard, cracks me up. Once I had them all arranged, I added them to a layer of patterned paper, and stamped the greeting to fill the empty space. I hope you like what you see so far, and be sure to check out the NT blog this morning to see what the rest of the DT created using these sets! Before you go, don't forget to leave a comment! 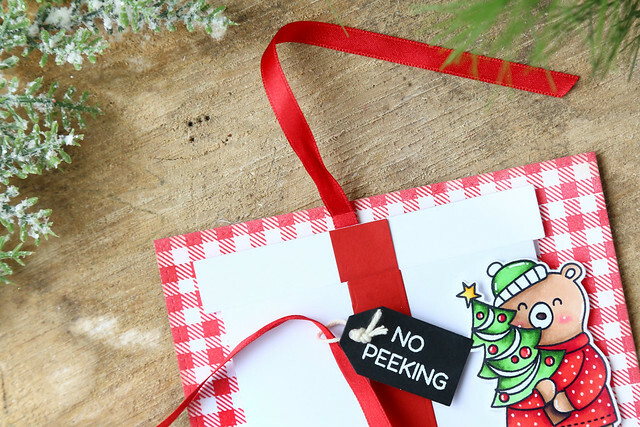 One lucky winner will be chosen from among all of the design team's blog comments this week - you could win a $25 store gift card! The winner will be announced on Friday morning. 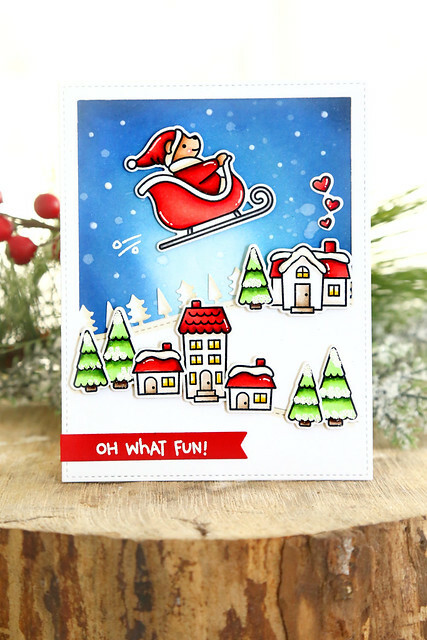 I used images from You're A Treat to create this soft card. Even the black cat is more of a soft grey! And I used a warm grey copic marker (W1) to shade the pumpkin just the tiniest bit, so that it still looked like a white pumpkin. No bright orange on this card! I gave the adorable witch a darker skin tone. I find it tricky to find the right combo that doesn't look too purple, or too yellow, but I was happy with this one. My daughter was thrilled that I colored the image to look like her! In case you'd like to try it out, the copic combo I used was E21, E35 and E37. Once the images were all colored, I stamped the greeting in a bold black ink, to ground all of them. I then set them against a hazy rose-beige sky, amid vellum clouds. The Making Waves die provided the most perfectly sized clouds for this card! And cut out of vellum, they are subtle but still add texture and a more interest to the background. 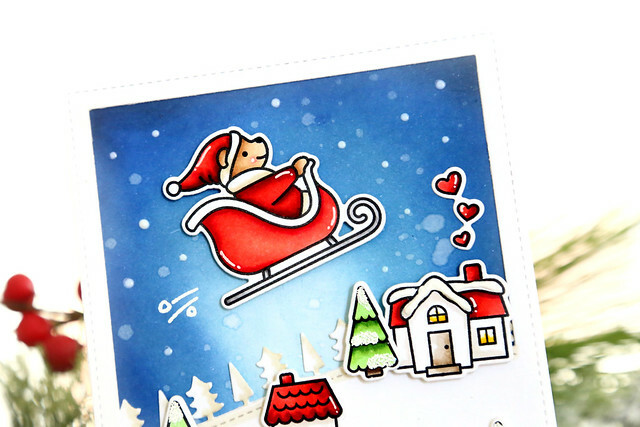 To finish things off, I used a white gel pen to add accents to the images, and to add little twinkly dots to the sky.